Netizens discovered that Seungri’s YouTube channel and Facebook have both disappeared. 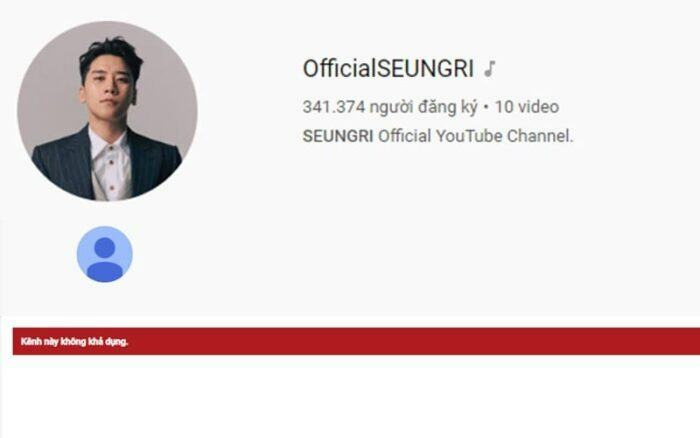 While Seungri‘s scandal has yet to finish, netizens found that the Big Bang former member’s official YouTube channel and Facebook no longer existed. Specifically, fans no longer have access to OfficialSEUNGRI Youtube channel with 341 thousand followers. Some people said that if you type the keyword “Seungri” on the search bar, the result of another channel with more than 16 thousand registrations shows up. However, videos are also changed to private mode. However, former Big Bang members’ solo MVs can still be found on Big Bang‘s official channel. Not only that, but Seungri‘s official Facebook also reported that the content is no longer available. Many people believe that there’s a high possibility that the Youtube account and Seungri‘s official Facebook has been deleted. Seungri’s official social networking sites are managed by YG Entertainment. Once the male idol has left Big Bang and terminated the contract with the company, YG will not continue to manage these channels. Did YG delete Seungri’s account because they ended the contract with the male idol? Previously, YG was criticized for being greedy because even though Seungri was no longer under the company, it still blatantly sold items related to former Big Bang member such as hairpins, T-shirts, cups, and bags at YG Select website. In addition, YG‘s official fan cafe managed by the Big Bang still holds the “1, 2, 3 MV!” and his “The Great Seungri” album. Currently, YG Entertainment has yet to speak out about this issue.